When Camp David started in 2003 we had ten acres of trees and fields. All the buildings and infrastructure that is here now is a result of hundreds of volunteers and work teams. These heroes built a camp for at-risk children and prisoners’ families. If you have some friends or a group that is interested in helping build and/or care for the camp facilities we would love to talk with you. Below is some information to answers some of your questions. To learn more please call 573-308-0602 or email ben@campdavidozarks.org. We have a variety of jobs depending on your skill level. They include constructing buildings, painting, putting up fencing, building benches, spreading mulch, and more. Depending on the project and size of your team you may be asked to raise the funds for the materials for the project. In 2016 we had some churches raise $800 for materials their work team used to remodel our wagons. We have several housing options that we can offer if you want to come for a week or weekend. We can house up to 60 people, with separate housing units for guys and girls. We ask that you team be responsible to clean facilities after its use. We have kitchen facilities for your team to cook their meals. You would be responsible to bring your own food and cooks. We also ask that you clean up after your meals and replace any supplies you use. There is a neat cave you can visit just 15 min. away. About 45 min away there is a park, Meremac Springs Park with a large natural spring and lots of fish. A lot of work teams stop in St. Louis and visit the St. Louis Arch or go to the City Museum. 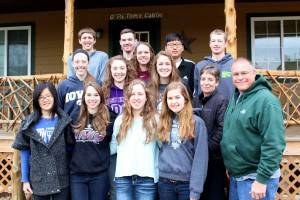 "The counselors amazed me with their loving care of their teams. It is so encouraging to see how God is working in the hearts of the generation who will replace us old folks, and giving them a desire to pray for others and serve them. This is a wonderful place for them to grow spiritually."